It was the 2016 Summer Olympics, and I was sitting on my couch watching the snippets of the throwing events. As the shot-putters and discus throwers threw unfathomable distances, I was determined to try track and field, more emphasis on field, during my junior year of high school. Fast forward to spring 2017. The first day of practice came around, and I found myself running laps around our school. “What is this,” I thought. I signed up to throw shot put and discus, not run the mile. As the season progressed, I slowly realized the importance of running was to bring up my agility and speed when throwing. At my first track meet, my coach told me I was going to do a half spin when throwing discus and glide when I was throwing shot put. And let me tell you, I did awful — 20 feet worse on discus than in practice and 5 feet worse on shot put! This was due to one thing — the technique. You see, I wasn’t comfortable with it. It didn’t fit the way I threw, and I had little practice with the techniques I used. Although I wasn’t doing the greatest, I didn’t want to just power throw. I didn’t want to be different from everyone else. I wanted so badly to be successful with the technique. However, during my senior year I realized it didn’t matter. If I didn’t use technique and just threw, I was successful. 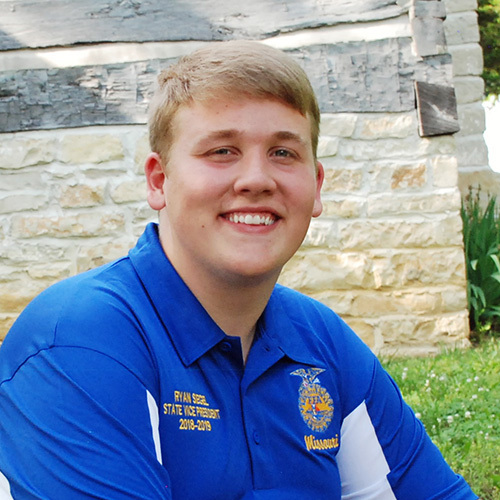 FFA members, throughout our FFA careers we must be willing to try new techniques, ideas, contests and opportunities. Still, we won’t always be the best. Sometimes by realizing where we fall in technique we can realize what needs work and build on our skills. Try something new, push yourself, grow from your failures, but never be afraid to just throw. Our last name is something that is so special to us; it is something that has been carried on for generations and generations. Our last name is also the focus of our FFA jackets, bringing pride, respect and honor to our families. When we think about our ancestry, we immediately think back as far as we can remember. Since I’m a genealogy nerd, I can tell you exactly where my fifth great-grandpa was born, when my family migrated from Europe and even a percentage breakdown of my DNA. However, with all these different family trees and last names that makes up who I am and who we are, one thing reigns true — the significance of our last names. The names might have been worn on the uniforms of our grandparents when they fought in a war, or by our parents who are farmers, business owners, doctors, or lawyers, and now by us on our FFA jackets. To you a last name has always been there, it’s just a few letters put together, but to those before you that last name was everything. It’s what defined your family, gave you the opportunities you have today and pushed you to success. It’s also what you bare over your chest in your FFA jacket. Though we all have different last names, we all have one common thing on our jackets: the FFA emblem. This FFA emblem is like our last name. It is what connects, what bring us together and what signifies our FFAmily. So, do everything in your power to bring honor and pride to your last name and the FFA emblem because those before you did just that. Imagine you are standing on a movie set, and you are the lead role. The director screams out, “Lights, Camera, Action.” You begin saying your lines, and the feeling is surreal! When the scene is over, you let out a sigh of relief, and you feel a little uneasy about it. You don’t think you did your best. You think you could have done better, but the director said that the cut was the best that it was ever going to be and that you gave it your all. You see, in this scenario the director is your FFA advisor, and the scene is your four years in high school. When you start the scene, the lights are blinding, you are shocked by what you can truly do to succeed. These blinding lights are a lot like your freshman year in FFA; you are shocked by the magnitude of the organization and all the older members are lifting you up, lighting your day with knowledge and wisdom. Helping you one day see the camera or the perception that everyone has of you, in this camera you are a superhero, farmer, friend, or a mentor. The camera is a lot like your senior year in FFA. Younger members are always watching you, waiting to follow your lead, while others see the impact you are making in this organization and your teachers and advisors notice how much you have grown and succeeded. Finally, you hear the word action, and you are sitting in your high school auditorium or football field with your cap and gown on. At this moment in time, you realize that it’s time for you to start acting in the next scene. You begin this scene in college, trade school, or on the farm. Yet, with each step that you take throughout this next scene in life, you act to improve the future of agriculture. When you hear lights, camera, action, what are you going to do to light up someone’s world, change the perception of agriculture, and act to improve and believe in the future of agriculture?